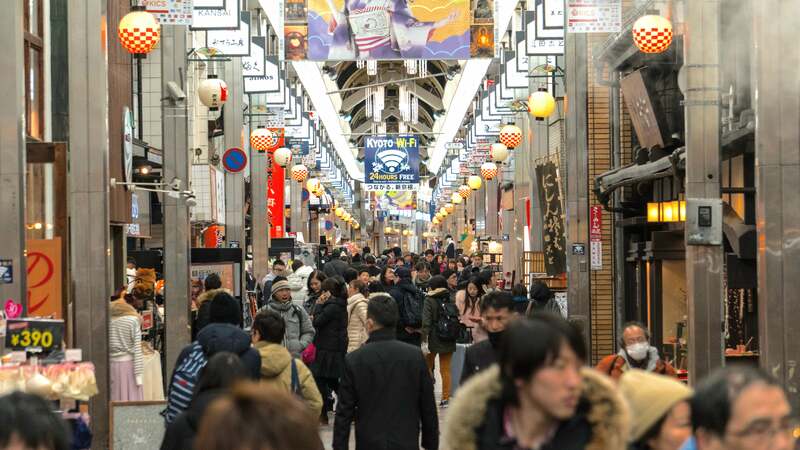 Japan is a great place to visit, especially for first-time international travellers. It feels completely different than Western countries, yet totally familiar. I recently got back from a trip there, and while it wasn't my first visit, I still learned a whole lot. Mainly, I figured out what kind of items are best to keep on you at all times. If you'd like to see what Japan is like first hand, and maybe check out the Robot Restaurant for yourself, good news. Jetstar is offering return airfares to Osaka and Narita for as little as $419. Here are the details. Nishiki Market Shopping District, Kyoto, Japan. Photo by Patrick Allan. Handkerchief: It is almost impossible to find paper towels in Japan, even in the bathrooms. In fact, you won't even be given real napkins in a lot of restaurants - they're just tissues - so it's imperative you carry a washable handkerchief with you. Fortunately, there are shops dedicated to beautiful handkerchiefs in all the touristy areas. Cash: Your credit card will probably work in a lot of the bigger shopping areas, especially at name-brand stores (and 7-11), but everywhere else, cash is king. If you want to eat yummy street food, try out that tiny ramen shop tucked away in the alley, buy some handmade goods from a stall, or be capable of eating at any restaurant, carry a lot of cash with you. Don't worry, Japan is incredibly safe. Coin purse: Speaking of cash... All those bills you're carrying quickly break down into frustratingly usable coins. What I mean is, you'll end up with a lot of change, and it's actually good to carry it with you (imagine if there were $5 coins in Australia instead of notes and you'll get the idea). Get yourself a coin purse! It doesn't have to be large, but even if you're a dude with a thousand pockets, having all that change in one place is much less annoying. Bonus: You get to regularly toss a bag of coins onto tables like you're in a fantasy world. Plastic bag: There are exactly 10 garbage bins on the streets of Tokyo. Good luck finding them. OK, I'm exaggerating, but still, they're a rare sight. That means you have to carry your garbage with you most of the time until you can dispense of it somewhere (such as your hotel or a convenience store), so keep a sealable plastic bag on you so you have somewhere to put it where it won't stink, spill or squish all over your clothes. That said, if most of your garbage is snack wrappers or drink bottles, you're doing it wrong! Eat or drink the thing you got right in front of the place you got it, then dispense of your rubbish there. Eating and drinking while walking around is frowned upon. Pasmo or Suica card: There are a ton of different train companies operating different railways all over Japan, but reloadable Pasmo and Suica train cards work with just about all of them. Load up your card and always keep it handy. Plus, you can often use them to buy snacks out of a vending machine. Or, if you're a fool like me, you can use them to pay for silly arcade games. Smartphone: This should be a no-brainer, but just in case you thought you wouldn't need it... well, you do. You'll use it quite a bit. It's useful for directions, train itineraries, and translating important conversations when the basic phrases you know just won't cut it. Pocket Wi-Fi: You can probably pay extra to have your smartphone operate normally in Japan, but it's expensive. You're better off renting a pocket Wi-Fi device (such as this one) that works anywhere you go. And if you're in a group, everyone can get Wi-Fi with just one device. You can rent them anywhere from five days to nearly 150 days, they will deliver it to your hotel so it's there when you arrive. When you're done with it you just put it in a pre-postaged envelope and drop it in a mail box. I can't recommend these enough. Battery pack: You'll need to keep your phone and pocket Wi-Fi operating all day (or you might get lost), so bring one of these along. Pocket phrasebook: I'm a big proponent of learning at least a little bit of a country's primary language before visiting. It means you don't have to rely on your phone (like if the battery dies), and it shows a genuine interest and respect for the culture as a tourist. I'm very aware people in many places will shrug you off and speak to you in English, but it's still nice to try. If a phrasebook is too bulky, just write down some of the essentials on an index card. Passport: Normally I don't carry my passport on me when I'm exploring a city (just a copy), but in Japan it's a good idea to keep it with you, especially if you want to shop. Japan offers purchases of over ¥5000 tax-free to foreigners, but you must have your real passport with you to do it. A copy will not do. If you have any of your own suggestions, feel free to mention them in the comments below! Happy travels. My suggestion would be a healthy supply of godzilla repellent. He attacked 2 times while i was there. But seriously these are all good suggestions. I cant really think of any new suggestions but just a couple add ons to his. For the pocket wifi, a lot of Airbnb places offer free pocket wifi for your stay. speaking of, if you haven't looked at Airbnb for a japan trip you should. Some very nice and reasonably priced places especially if you are going with someone. I'm not sure I agree with #1. Most restaurants do provide napkins, sometimes/usually a hot or cold towel at the beginning of the meal to wash your hands and face. You can use it during your meal. But 100% agree with #4, there are NO public bins in Japan, at all. If you do end up finding one, it'll be overflowing. Even in hotel rooms they only provide a small dust bin (only large enough to hold 3 drink cans), never a 'proper' sized bin. And don't even think about putting rubbish next to the bin, room service will not remove it. Be warned about tax free. It's only 8% back, and sometimes it can be a real hassle. There can be heaps of paperwork you have to fill out at the store and sometimes they seal up what you buy in a bag that you can't open till you go through airport security. We purchased stationary and forgot there were some expensive scissors in the bag. We would have lost them (can't have scissors in carry-on) but I managed to extract them through a gap in the bag. Anything larger would have been confiscated by airport security or I don't know what would have happened if they noticed we opened the bag.